You may have heard that Canabalt's on sale this weekend as part of the Because We May sale. But if you see something called Canabalt HD on the App Store, don't buy it. It's a fake. Adam Saltsman's infinite-runner iPhone smash doesn't have an HD version, you see. It's always terrible when fake versions of beloved games—like Pokemon and Mega Man— show up on Apple's digital download hub. Worse still is when scammers rip off the work of inventive indies like One and One Story, games whose creators have crafted out of blood, sweat and tears with no financial safety net. But more despicable than even those acts is somehow getting a version of one of the earliest and best iPhone games onto the App Store during the same weekend that indie creators are holding a sale to demonstrate the power of price controls to help them promote their games. 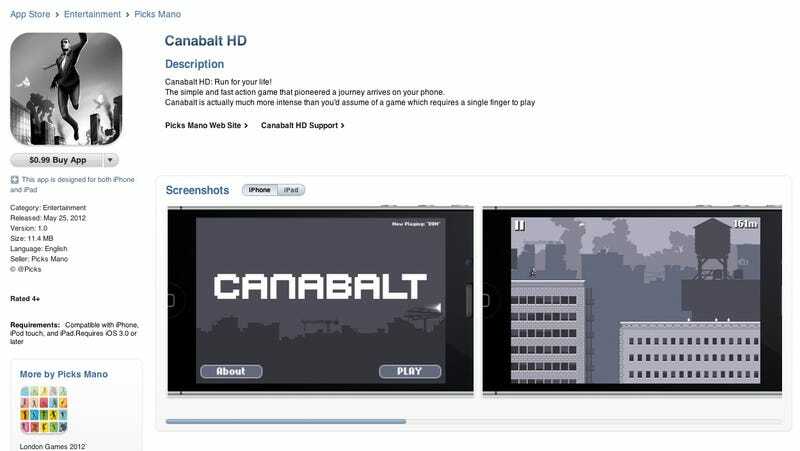 The fake version of Canabalt is credited to one Picks Mano, whose also got a rudimentary London Olympic games guide app under his name. That too smells of opportunistic scam. But the Canabalt one is arguably worse, since it pops up during the Because We May sale during the long Memorial Day holiday weekend. That means that it might be up to three days before the app gets pulled. So, again, if you see this Canabalt HD on the App Store, don't buy it.